2-wave highway guardrail roll forming machine which can be driven both by chain-brackets and gear-boxes, our 3-wave expressway guardrail roll forming machine can be driven or transmitted with only gear-boxes .The 3-wave crash barrier roll forming machine is much bigger and heavier than 2-wave highway guardrail roll forming machine, but both of them are controlled by PLC computer system. 7-roller levelling:3 top and 4 bottom. Material of Roll: 45# steel quenched into HRC48�～52�and coated with hard chrome. Using type Yl32-315 hydraulic puching machin with 4 pillars. Material of blade: Cr12 quenched 58-62. 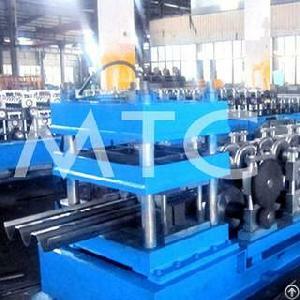 Material of Roller: GCr15 steel with tempering, quenching and forging treatment, crash barrier roll forming machine. Power of Main Machine: 30kw. Material of cutter blade: Cr12MoV steel with quenched treatment. Working pressure:30mpa for 3-wave expressway guardrail roll forming machine or crash barrier roll forming machine.